Electric vs Traditional: Which Does Your Dentist in Las Cruces Recommend? Electric vs Traditional: Which One Does Your Dentist in Las Cruces Recommend? Yes, you’ve seen the commercials of electric toothbrushes bursting out of water. They display all the bristles and types of heads available for the brush. As enticing as it they may look, you’re left with a question: how do electric toothbrushes really compare to traditional ones? Over the years you like to think you’ve gotten pretty good with a toothbrush, but perhaps you’re tired of the old back and forth method of brushing. As absurd as it sounds, brushing teeth shouldn’t take that much energy. You’re not the only one; your dentist in Las Cruces thinks the switch is worth it. Most of us started on a manual toothbrush as a kid. Now that we’ve gotten older and busier, we may have skipped brushing occasionally cause we needed to be somewhere. Perhaps we were already cozied up in bed and didn’t want to get back up to exert the energy. The allure of brushing has been lost as we aged, but that doesn’t mean that technology has slowed down. 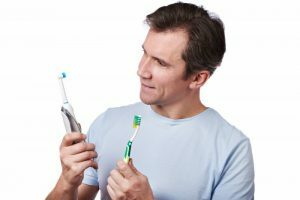 In fact, electric toothbrushes have been shown to provide between 6,000 and 30,000 strokes per minute, meaning you spend less time focusing on technique and more on getting your teeth clean. The variety of different heads lets you cater more to your tastes and ensure each tooth is getting equal coverage during your morning/evening ritual. If you have less dexterity than the average person or find it difficult to get a firm grip on a manual toothbrush, the electric alternative will definitely make the process easier. This includes people with arthritis or motor difficulties that make it harder to brush. This streamlines the process to just slowly running the brush across each individual tooth. While it’s still important to dedicate at least 2 minutes of brushing twice a day, it shouldn’t feel like a workout just to get the tough spots like in the back of your mouth. Much of the rotating and scrubbing that would be required of a manual toothbrush is removed since the head does most of the work. The vibrations will do a better job of reducing tooth decay and removing stubborn bacteria off your tongue. Think of it like this. After a long day of working, whether at the office or outside, you’re curled up in your favorite chair or on the couch and realize “Man, I could really go for a massage right now.” Imagine an electric toothbrush as a massage for your teeth and gums. After a long day of chewing and separating foods, it needs to kick off plaque like how you need to kick off your shoes. Let brushing your teeth be fun again. Consider making the switch today for a more rewarding brushing experience! Dr. Ramon M. Ortiz DDS is a graduate of Onate High School who went on to spend 8 years earning his dental degree in Omaha, NE. Outside of his practice, he works as a Patterson Dental CEREC trainer, training other dentists how to use CEREC technology in the Southern New Mexico and El Paso area. To learn more about his practice, contact the office at (575) 521 8720 or at his website. Comments Off on Electric vs Traditional: Which One Does Your Dentist in Las Cruces Recommend?